Women’s basketball in Greene Co.
After James Naismith hung that peach basket on a pole to encourage the young men in his area to get more active during the winter months, basketball has been a leading sport around the country. Originally, the game was intended for young men, but it was not long before the ladies became interested. Some high schools offered basketball for young women a century ago. Over the years, some of the rules have changed, but the game continues to attract people of all ages and abilities. Now that March Madness is in full swing, today’s feature is girls’ basketball teamS in the late 1930’s. During the 1938-40 seasons, the Greene County Rural Scholastic League consisted of teams from Bellbrook, Silvercreek, Yellow Springs, Beavercreek, Jefferson, Ross, Cedarville and Spring Valley. In February of the 1938-39 seasons the girls had a great season. Beavercreek had a record 5-1 while Ross boasted 4-2; Spring Valley was third in the league with 4-2; Cedarville 3-2-1 (tie), Bellbrook lists 2-2-1, Jefferson 3-3, Silvercreek 1-3 and Yellow Springs 4-2. Beavercreek had the wining team that year, having defeated Spring Valley’s girls by a score of 32 to 14. Ross girls beat Yellow Springs by 25 to 18, giving each of those teams a final factory of six wins and one defeat, thus they shared the league flag. Spring Valley placed third that year in the league. Most of the teams were also part of the Greene County Grange League. In 1939, the Spring Valley girls had a winning streak with seven straight victories to their credit including a win over Xenia by a score of 11 to 7. The girls enjoyed the sport and excelled in their league, but at the beginning of the 1939-40 season all teams were informed that the upcoming season would be the last for girl’s intermural basketball. On April 19, 1939, the Xenia Gazette published the following: “Schools to Drop Girls’ Basketball”. The sub-title read “High Schools Outlaw Inter-School Games as too strenuous”. Of course, the girls were very upset with this ultimatum. They enjoyed the sport, and enjoyed the league play as well, but this was not a local decision, this ruling came from the State of Ohio. A Columbus newspaper reported the following: “Ohio high schools in a referendum vote outlawed inter-school girls’ basketball games after next season. H. R. Townsend, Commissioner of the Ohio High School Athletic Association said today by a vote of 384 to 190 the schools agreed to discontinue girls’ court games after Sept. 1, 1940. Townsend said the sport was regarded too strenuous for girl players”. At that time, a team consisted of twelve girls, six on the floor at any time, thee forwards and three guards. Mary Wilma Laurens was a forward on the Spring Valley team, and because she was left-handed the opposition had a tough time preventing her from making baskets. The coach for the Spring Valley girls’ team was Miss Olive Huston, school principal and later Mayor of Xenia. In the middle of January Spring Valley and Bellbrook were leading the league with Beavercreek close behind. The girls from Spring Valley started a winning streak which continued throughout the season. They finished with seven straight wins and no losses, thus securing the division titles in both divisions. For the first time, a double elimination plan was used in the tourneys. Three trophies were to be presented to the three top teams in the girls’ division. The first and second place teams going into the tournament would be paired to determine the first and second place winners; then the third and fourth place teams met for the third place cup. Individual medals were given to the first and second place team members and a trophy to each of the first three winning teams. Drawings for the tournament were held in the office of H. C. Altman, Greene County Superintendent of Schools. I don’t know how much admission charged for the girls’ games, but for the boys, the admission was thirty-five cents per session or $1.25 for all five games. Both boys and girls games were played at the Xenia Central physical education building. Having already won the division title, the Spring Valley Spartan Girls’ team was attempting to win the Greene County title. At that time, girls did not go on to regional or state tournaments. February 12, Ross and Jefferson would battle for the third place feminine trophy. On February 26, Spring Valley was to play Bellbrook, in order to determine the first and second place winners. Spring Valley won the first place trophy. It was with mixed feelings that the team accepted that trophy. This was a great honor, but it was also the last time for a number of years that girls would be allowed to play intermural basketball. That same year, the Spring Valley boys’ basketball team won the Greene County Tournament and went on to play in the state. Though they didn’t bring home a trophy from the state, the school celebrated with a special event honoring both the girls and boys winning teams. 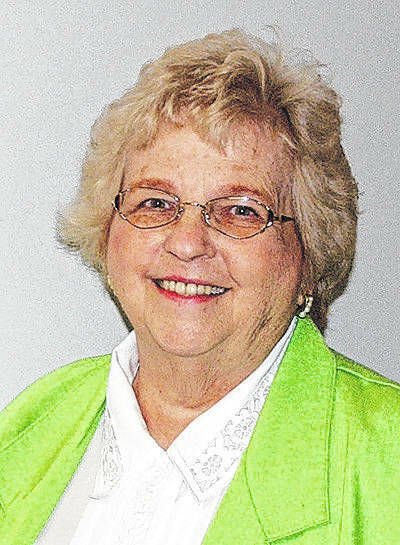 Joan Baxter is a Greene County resident and long-time historical columnist.